Whether you are an employer or a medical professional contact us today and experience the benefits of dealing with one of the finest Locum Medical Recruitment agencies in South Africa. I Dr MM Stoltz hereby wish to confirm that I have used the Health Staff services since it started. I am very happy with their service and placements of locums at the surgery and will recommend them to my colleagues as well. Ons maak die afgelope 2 jaar gereeld gebruik van Health Staff se dienste. Ons was nog nooit ontevrede met enige van die locum dokters wat hulle vir ons gestuur het nie. Hulle het 'n databasis van betroubare, bekwame dokters. Hulle diens is professioneel en van 'n hoe gehalte. Die personeel is flink en baie vriendelik. Ons kan altyd staatmaak op hulle en vertrou hulle ten volle om locums vir ons te reel. Ons kan hulle met 'n geruste hart aanbeveel. Johann van der Merwe (representative of Health Staff (PTY) Ltd recently successfully arranged an excellent locum pharmacist for our store on very short notice, despite our remote location. The arrangements were made swiftly and professionally. I have truly been impressed by the exceptional level of service that has been provided to the store and I would highly recommend the services of Health Staff (PTY) Ltd.
We have been using Health Staff as our only option in placing locums in our practice for the last 3 years. They are very efficient and have an excellent understanding of the specific profile we need in a doctor that will fit into our established family practice. I can highly recommend Health Staff and it is always a pleasure to interact with Sonika and the rest of the friendly staff. As one of the consultants dealing with compiling rosters for our busy obstetric and gyneacology service at Tygerberg Hospital, I have dealt extensively with Health Staff, mainly indirectly through Mrs Paula Arnold. We have been very pleased with the service provided by Health Staff. Their locums are of a good standard and our requests are dealt with in an efficient, professional and courteous manner. I recommend we continue to make use of this agency in the future. We make frequent use of Health Staff agency for all our locums. The Health Staff personnel are always very friendly and helpful. The doctors they have referred to us have been reliable and efficient. We are happy with the service we receive from them. Apply now and let great locum jobs find you! 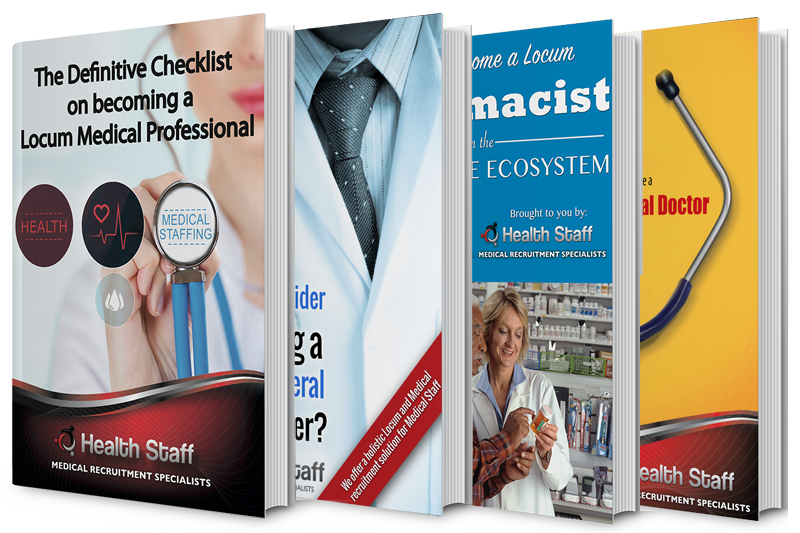 Receive our Exclusive eBooks Free when you register, "The Definitive Checklist on becoming a Locum Medical Professional" including "How to Become a Locum Pharmacist in the Healthcare Ecosystem." Register Now for Locum Opportunities!